Indie’s back and older than ever. So my first question for this movie is why did they have to make this? Then as soon as I saw this movie I realized why, all just for the movie. I mean I know what Spielberg and Lucas were trying to do by making this the second highest grossing movie of 2008 but still at least make it worth all that money. All that $786 million that is. There are many problems with this film so I’m just going to get right down to it. First of all what made all of the other Indy films great was the mixture of action and comedy. We barely get any of that. 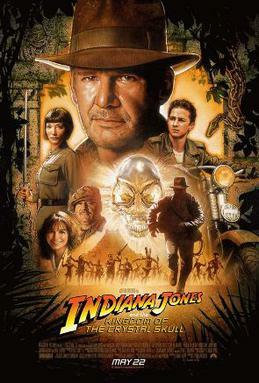 The action happens and I was satisfied with it but there wasn’t enough of it for an Indiana Jones film. Also the script is so dry that it makes the Sahara Desert look like Niagra Falls. There is no wit whatsoever and I never caught myself laughing, as I did in the previous ones. What made the other Indy films great was that they barely ever relied on special effects, if any at all. There were so many computerized scenes that it totally took away the feeling of this way everything seemed so realistic. Lastly, the main problem with this film is the story of aliens. That’s right people you heard me correct there are aliens in this film. This is so ludicrous to the Indy franchise that I can’t even speak. There never were any aliens and there never should be in the Indy franchise, and that’s final!!!!! This just made the story so much more confusing then I could have ever imagined. However this film wasn’t so horrible, it did have some high points. I just liked the feeling of how Indy was back on the screen once again. The movie was kind of like a reunion tour from like The Eagles or Rolling Stones, they’re not as great as they used to be but it’s still cool to see them playing out there and sort of giving a tribute. This is Indiana Jones’ reunion tour and I just liked seeing that Indy is alive and well. Also despite Indy being an old fart Harrison Ford still does have his acting chops that made him and Indy famous before and I liked Shia Labeouf, pairing them two together was a nice passing of the torch moment at the end that i think all can enjoy. Probably why I didn’t like this movie as much was because I was expecting more from Spielberg who has made some of the greatest movies I have ever seen (Schindler’s List, Saving Private Ryan). This is a very watered down version of all the Indy films and I wouldn’t be surprised to see this be the last of the Indy films. Still as much as I disliked it I still have to give it a in the middle rating since it’s always good to see one of the finest movie hero’s, Indiana Jones, back in work. i’m glad indiana jones came back and ended up with marion ravenwood. because truth is they belong together. they should have made this movie in the 90’s or before 9/11. it would have been better a couple years after the third one. harrison ford is still one of my favorite actors besides mel gibson.